Free basic health screening, free book giveaways and free herb plants were among the highlights at the half-day exhibition held at the main campus today in conjunction with WOU’s safety, security and health campaign. Checking out the free books being given away. Nine exhibitors participated in this annual event. They were Loh Guan Lye Specialists Centre, General Services & Administration (GSA) Department, WOU Library, Essential Atlas, Road Safety Department, State Health Department, Northeast District Health Office, National Cancer Society of Malaysia Penang branch, and the Consumers Association of Penang. Safety helmets and vests for road safety. 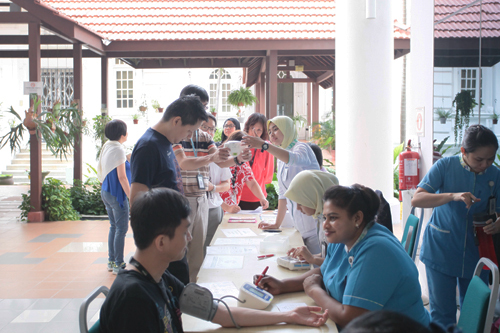 GSA staff gave out 100 bags of Oregano (Mountain Mint) and Misai Kucing (Cats Whiskers) on a first-come-first-serve basis while the Specialists Centre offered free basic health screening, including blood pressure measurement. Many people signed up at the Essential Atlas booth to take up their offer of free kayaking sessions during the weekends. Herb plants courtesy of the General Services and Administration Department. 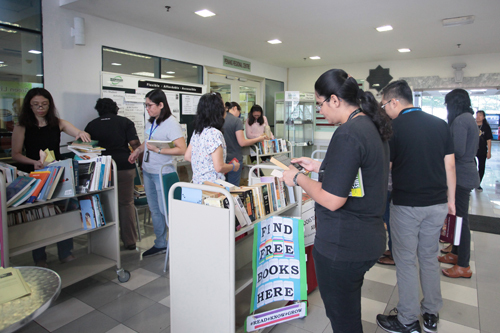 Hundreds of books, both fiction and non-fiction, disappeared quickly as staff and students grabbed books on various topics for their studies and for recreational reading. This exhibition was the culmination of the safety, security and health campaign which had kicked off on September 19th with a briefing session for WOU’s Emergency Response Team (ERT) members. It served to refresh their knowledge and skills on proper ERT measures. Ooi Ching Hong of ITS gets his blood pressure measured as other University staff wait their turn. WOU Safety and Security Committee chairman Andrew Joseph briefed them on the safety measures, namely the emergency escape plans for the Albukhary Building and Homestead, emergency assembly area and the various types of emergency. There was also a site familiarisation visit on the fire-fighting equipment system and the emergency exits. The fire fighting system in place at WOU encompasses the fire extinguisher, hose reel, sprinkler system, fire break glass, fire alarm, smoke detector, fire rated door, fire intercom system and the fire hydrant. Signing up for free kayaking sessions. The Safety and Security Committee also conducted a university-wide fire drill on September 20th to test its evacuation plan, with the ERT members called upon to perform their role of escorting staff, students and tenants out, and doing the roll call.